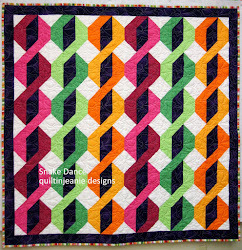 Jean's Quilting Page: Where do I begin? It's been a busy month and I'm behind on blogging so I don't really know where to begin. I haven't done much sewing myself, but I've had a lot of classes. Unfortunately, I didn't take a ton of pictures, so I will share what I did take. I had 9 students in last week's Explorer Tote class. It was busy busy til the end, hence no pics. No one finished their bags in class, but two came in to share their totes with me....Susy (above) and Nancy P. (below) used the same fabrics as I did and were excited to finish them. 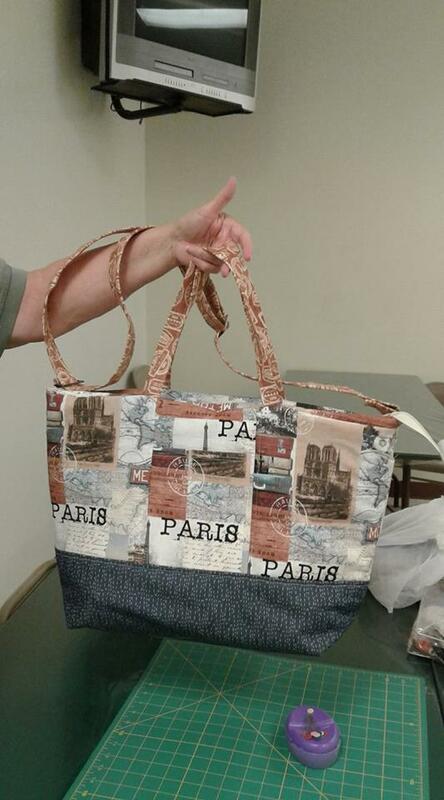 I hope the other ladies send me pix or stop in to show me their finished totes too! 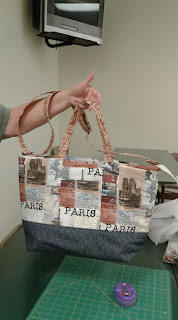 Nancy B. brought her Log Cabin bag in to show us during the Log Cabin Tuesday class. 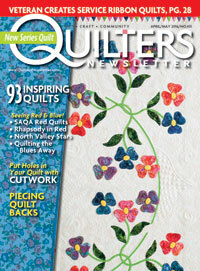 She wanted to make it instead of a quilt. Very pretty! Nancy P. has her blocks all finished! She is making a twin size quilt. 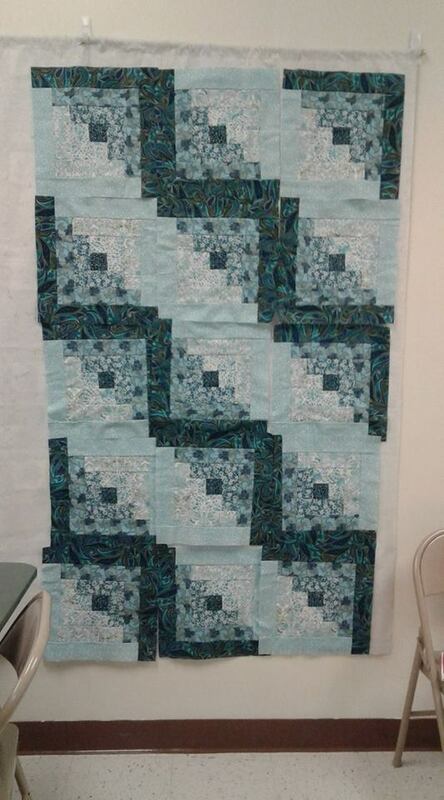 Deby is about 2/3 finshed with her blocks. She is making a queen size quilt. Martha and Debbie couldn't make it to class so we are excited to see how far they have gotten. 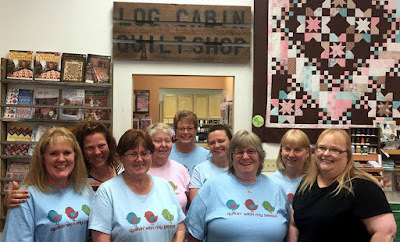 I taught the T-shirt quilt class a few weeks ago too. We got a good start on some layouts! I have several of the new Optical Illusions Sampler Clubs going on now, so here are a few pix frothose. 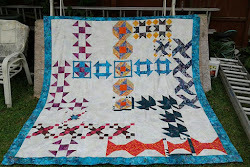 Love how they are getting excited about the curved piecing and making these eclectic blocks. 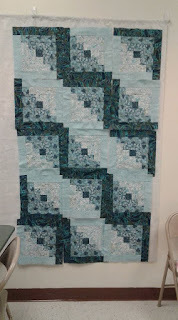 My guild meeting is Tuesday night, so it will be fun to see the "reveals" on the Alphabet Challenge. I want to try to get some pictures of some of the other members' projects. Mine was the Unzip Clutch, that I posted about last time. I don't have too many new classes in the next few weeks and will be out of school in about a month, so hopefully will have more time for sewing! 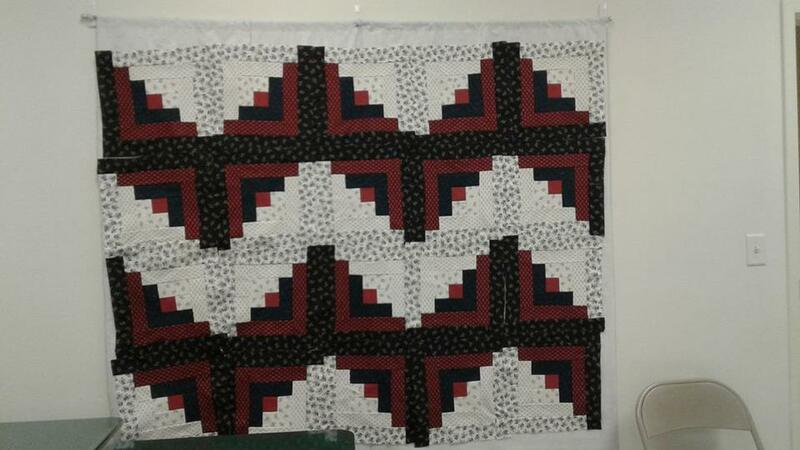 I'm off today and want to clean and organize the quilt machine room so I could maybe load a quilt and quilt it. Plus the grass has been growing like crazy with all the rain, so it needs to be mowed. Have a great Mother's Day weekend! You have been busy - they have a wonderful teacher. I am working in the garden time of year but soon back to sewing room. Wow, the t-shirt class really made great progress! I'm impressed. Love all the wonderful projects. Looking forward to some pictures from the Alphabet challenge, too. One VERY busy Lady!! You lead many interesting projects in your classes, wish I had more free time! !